Sunday saw a treble for the yard as the value of experience and our link to Norman Court Stud's Sixties Icon came to the fore in testing conditions at Goodwood. First up was John Turner's TWO BLONDES who took full advantage of his racecourse experience against his fellow juveniles to take the Class 5 maiden auction over a mile under Franny Norton. Rated 77 and with five places in seven previous outings under his belt before Sunday, TWO BLONDES took the race by the scruff of the neck in almost zero visability, but from what we could see through the fog, the race was won a long way out and, although his big lead was eaten in to in the closing stages, Franny kept TWO BLONDES together inside the distance to record a length success over Aspire Tower to the delight of his sodden trainer. "That was what we wanted to see because he's done little wrong and just kept bumping into one or two too good in the first half of the season. We fitted him with a visor for the first time and with the testing ground I knew he'd take a lot of catching if we rode him positively and that's how things turned out. "It looked a winnable race and off of a rating of 77 this made more sense that throwing him in to a nursery. He's fairly exposed under those conditions but in maiden company, I don't expect his mark to be unduly damaged as a result." 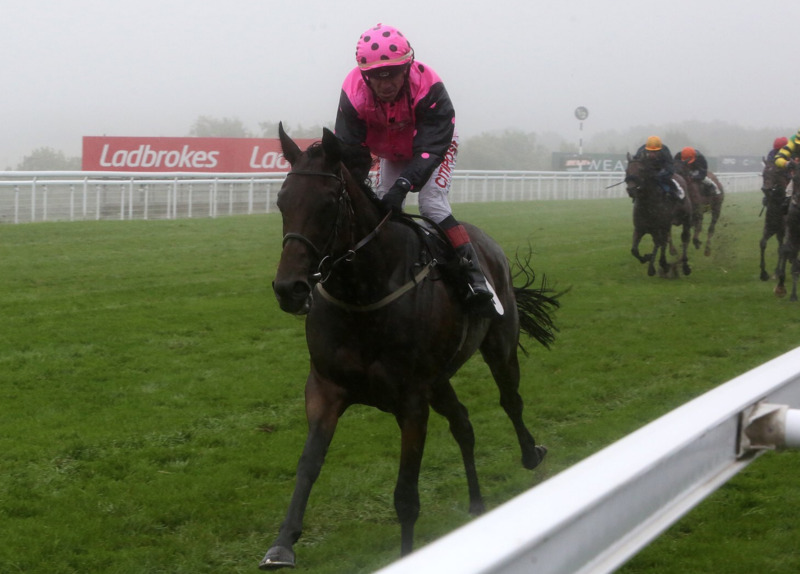 In the next race, it was CAN CAN SIXTY TWO's opportunity to shine in the gloom as a return to the soft ground that saw her win to great effect at Salisbury at the start of the season, she took the Class 3 seller over eleven furlongs. With Charlie Bishop up, the tactics were exactly the same and they just couldn't catch the three year old daughter of Sixties Icon who hosed up by eleven lengths in a victory that delighted Mick. "This was only a seller but I expect her to go in again as the autumn ground will give her plenty of opportunities to showcase her liking for a bit of dig in the ground. "Sixties Icon's offspring go in all types of conditions but they are also very versatile and because they are often very economical in their actions, soft groung gives ours an extra string to their bows. That's the evidence our eyes although Charlie didn't have to win by 11 lengths!" Indeed, in the Class 3 mile and a half handicap for three year olds and upwards, another Sixties Icon filly FANNIE BY GASLIGHT took the valuable fifteen thousand pound first prize in the colours of Aston Bloodstock by another considerable margin - this time eight lengths. Franny Norton was up again and it really was a front running ride that left the others very little chance as, having got a breather into FANNIE down the hill, Franny punched her out to record a facile victory that left him somewhat surprised considering the company she took apart. "Franny just shrugged when he came in because this represented a massive step up for the filly," explained Mick. "She's destroyed a field of fillies rated in the high 80's and low 90's. She's only raced on fast ground but we knew she'd like the conditions. That said, off of bottom weight and only rated 68, I guess people were justified in thinking this was a flight of fancy. "She's always had a great attitude though. She's a three year old who only started racing this year and she's backed up her previous victory on firm ground at Salisbury on her handicap debut and now shown she's improved for a further step up in trip and that she relished the ground. "It all bodes well for another of our fillies from the stud who may well have a good autumn." On Bank Holiday Monday at Epsom, the Guest family's CHARMING GUEST teamed up with Andrea Atzeni to take the Class 5 six furlong handicap for three year olds in very strong fashion. This was the daughter of Kodiac's third win of the year and showed that she too might haver a decent end to 2018 as she won convincingly to defeat the favourite Han Solo Berger by two lengths. Mick is hopeful that she can go on from here. "She's won off of a mark of 71 and although she'll go up for that, she's really found a level of professionalism that suggests that she has more to come. "After the setback that saw her miss most of her two year old season, she's really come good for us and although we've kept her busy this year we've not had to work her much at home. We've just let her find her feet and sent her out because she's got plenty of ability and I see her as a slow burner who will just keep improving." 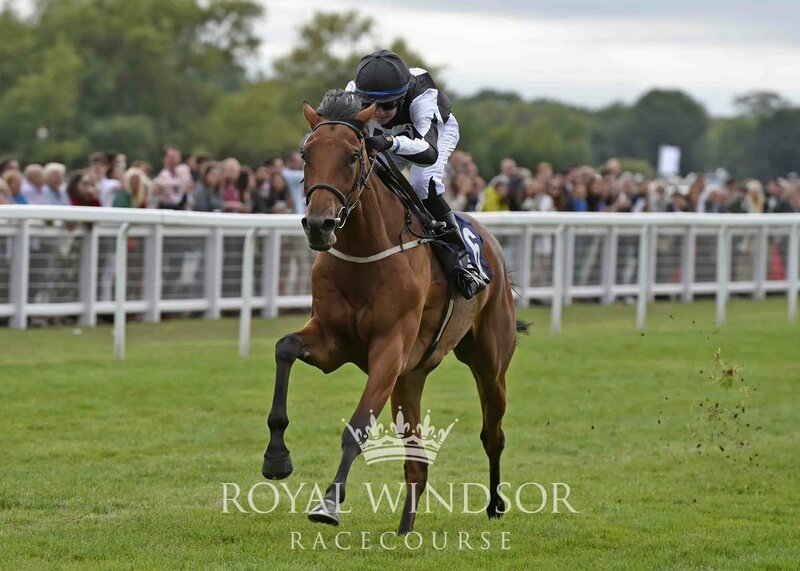 A four year old on the ascent and a victory showcasing the talent of William Harrison-Allan's HATS OFF TO LARRY as the son of Sixties Icon romped home at Windsor on Monday evening under the in-form Scott McCullagh. Having really come in to his own this year after previous victories at Beverley and Windsor, HATS OFF TO LARRY underlined his blossoming talent in the Class 4 mile and a quarter affair for four year olds and upward in eyecatching style. Indeed, having been forced to go wide around the bend, he was caught flat footed as they straightened up and kicked for home up ahead and, although stone last at that point, a cool ride from McCullagh saw him produce his mount in the closing stages, storming to the front in the final half furlong to leave Mick beaming. "That was a super effort and all credit to the horse. He's come on a ton this year and who knows what lies in store? He's got a bit of everything - size scope and a great attitude which he's shown since first getting his head in front at Beverley. "He's truly going the right way now and has bags of potential. It wouldn't surprise me if he went on to be a bright prospect this winter as a jumper. He's an absolute smasher who could well go chasing later on." A tale of two horses as a long and winding road to the winner's enclosure saw MACHO MOVER clock up two wins in a week whilst CONVERTER took to life on the track with ease as he scored on debut at Nottingham. For Box 41's MACHO MOVER, he's taken his time to come good but that wasn't exactly a shock as the son of Camacho always looked like he'd need time - he did nothing but grow as a juvenile. 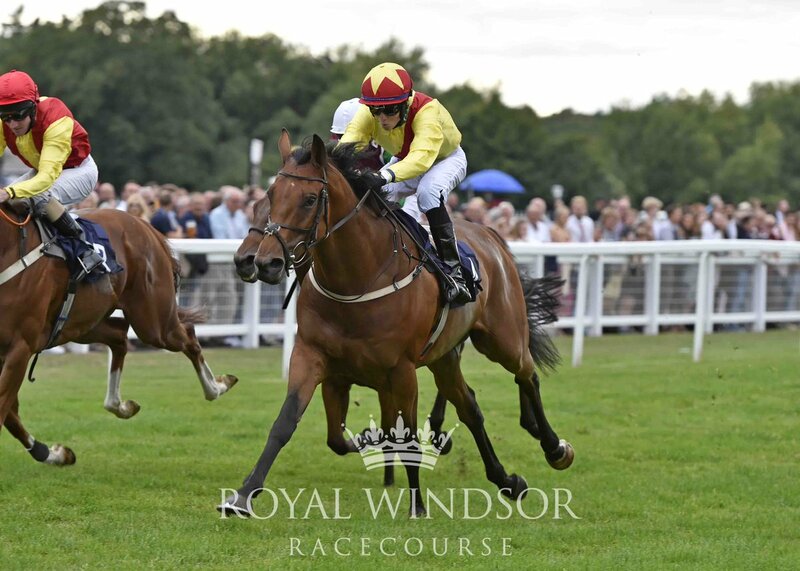 Up until last Monday at Windsor, his race record was that of ten runs but only one placed effort, hardly exciting stuff for the syndicate but Mick knew that it was always going to be a waiting game and with the step up from a mile to middle distances, MACHO MOVER looks to have found his niche. Piloted by Scott McCullagh last Monday he was a facile winner of the Class 6, extended mile and three furlong handicap, stretching away to record a four length victory off of a mark of 51. He returned to the track on Saturday evening, taking in the joys of Chepstow against similar company under a penalty with McCullagh again up. With a ride reminiscent of that given to The Night Porter at Goodwood, McCullagh stalked the pack throughout before winding it up in the straight. It was textbook stuff that saw MACHO MOVER get up well inside the distance to give Mick reason to be cheerful after a long wait for the three year old to come good. "That was pleasing and with two wins inside a week we've obviously done something right. He was tall and gangly last year, he still is really but we didn't want to hang about for perfection. He's a syndicate horse and we certainly haven't been hard on him at home. "He's learnt his trade on the track and we let him find his own level and it seems that he's just coming good now. Stepping him up in trip was always the plan but as long as there's a bit of pace on he can be a threat at this level. He romped home over a mile and a half at Windsor and got a peach of a ride at Chepstow over two furlongs less and I'm chuffed for Box 41. "It's never easy to have to wait for a horse to come good but they've seen it all before and I'm just glad they've been rewarded. This horse has never shirked the issue and he has a great attitude, it was just a question of waiting for his wave. He's done that now and I think there's more to come." In between those victories, Abdullateef Al Zeer's CONVERTER took the Class 5, six furlong maiden at Nottingham on Friday in the style of a colt with above average ability. The son of Swiss Spirit was largely ignored in the market but made great strides in the closing quarter mile having been out the back for much of the contest. With the more experienced Qutob always up with the pace though, CONVERTER had a target to aim at and he rattled home in the final furlong on the stand side rail to record a surprising, yet convincing victory under Franny Norton at 16/1. CONVERTER has a fancy entry and Mick was encouraged by a likeable debut. "He's a lovely big unit this lad and we just had to keep him ticking along during the dry spell because we didn't want to jar him up - he clearly enjoyed the rain that fell last week and a bit of dig in the ground. "We've got him in the Middle Park which may well be an option but he'll need to come on for Friday, and we'll look to get another run in to him and see where we are with him then before making any bold statements. "He's just a smashing type and has all the tools to be decent." 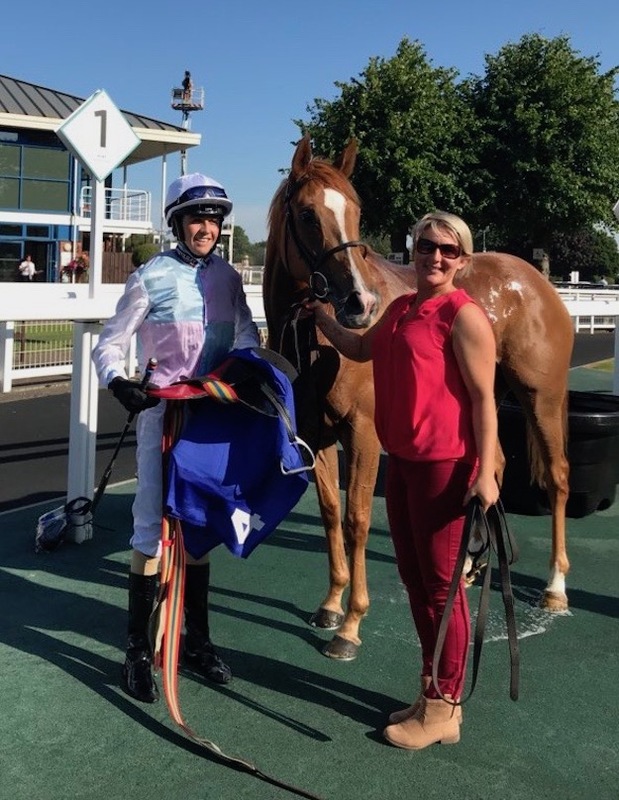 He's only been with us a short time but apprentice Scott McCullagh enjoyed two more winners on Thursday and Saturday, showcasing his talents under two sorts ideally suited to strike in the formative months of a jockey's education in the UK. There wasn't much you could say about ICONIC BELLE's latest victory at Epsom on Thursday - it was merely a case of 'more of the same' as the Sweet Partnership's four year old daughter of Sixties Icon made it three wins and a place in her last four outings under McCullagh when taking the Apprentice handicap at the Esher venue. The mile and a quarter Class 5 event for four year olds and upwards saw ICONIC BELLE jump smartly and, although she excels at front running, McCullagh was smart enough to track The Lord's Walk who was intent on making it. 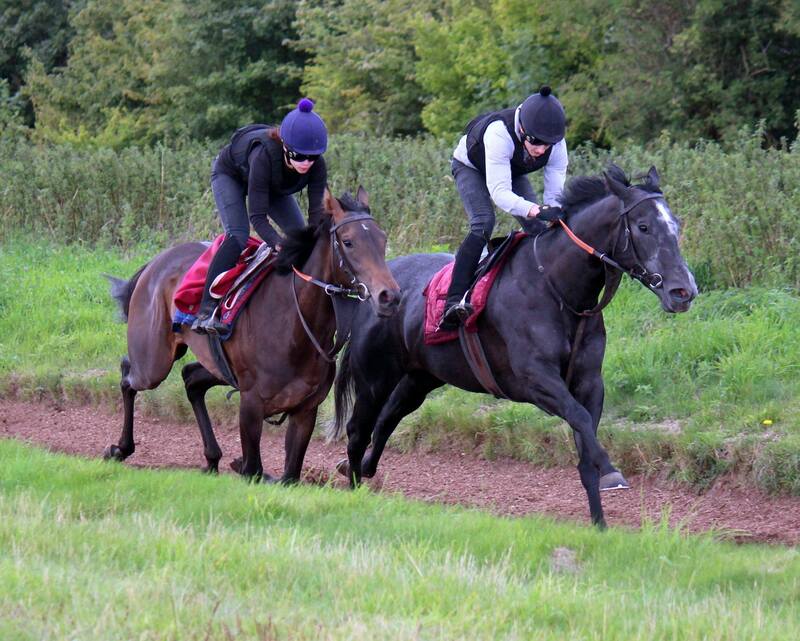 That he did until a quarter of a mile from home when ICONIC BELLE was asked to extend and she did so in fine style. Clearly the pace was honest but not excessive as the front two were never bothered by any of their five pursuers, with the West Ilsley filly winning by a comfortable half length to record her fourth win of the campaign. Two days later in the finale of Glorious Goodwood, the valuable Class 3 Qatar Apprentice Handicap went the way of the ever improving THE NIGHT PORTER who recorded his third victory in his debut season as a three year old in a style completely opposite to that of ICONIC BELLE. The son of Sixties Icon was stone last for much of it as McCullagh took his time before bringing THE NIGHT PORTER home in thrilling and assured style, sweeping past all of his eleven opponents in the manner of a horse with a bright future. As THE NIGHT PORTER's owner, Mick was obviously delighted with both horse and jockey. "That'll do! Scott is clearly loving life at the minute and without being too much of a grump, he needs to be aware of how much he's benefitted from having ICONIC BELLE in the form of her life and the fact that THE NIGHT PORTER is a young horse very much going places. "He knows that though - he's a bright lad and very much from racing stock. His dad Niall has won Group races galore and came over to make sure he settled in with us here and his lad has a good head on his shoulders. "Hard work is the way forward and if Scott proves to be as progressive as THE NIGHT PORTER he won't go far wrong. He's a smashing individual with a great attitude and untapped potential. "He's gone up from his mark of 86 on Saturday to 94 now and I can't see that stopping him. Another two winners from Norman Court Stud and another emerging talent underlining Sixties Icon's reputation for prucing winners. "I sometimes wonder where we'd be without him as a stallion." A very pleasing result from an ever improving filly as Jon & Julia Aisbitt's CARAVELA won in thrilling fashion on day two of Glorious Goodwood. The last six months has seen the four year old daughter of Henrythenavigator finally find a bit of consistency after a series of frustrating setbacks in the first two years of her career and she's a filly very much on the up after yesterday's performance. Under a patient ride from Andrea Atzeni, CARAVELA (as is her way) was slowly away from the gate and sat in behind the entire field off of what was something of a muddling pace before making her move in the mile and a quarter Class 2 fillies' handicap for three year olds and upwards. A winner two starts ago at Newbury, a strange situation emerged on her next start at Salisbury where she was essentially in a match race with three year old Savaanah. Acceding six pounds to her rival that day, CARAVELA went down by a length but the tables were very much turned yesterday as she reopposed Savaanah, this time off of level weights. The final quarter mile, still with plenty to do, the front running Savaanah was still there but Andrea pulled CARAVELA to the outside and once she found her stride she ran right through the line to record an extending length and three quarter victory to the delight of everyone, including the Boss who believes that everything is now coming right for a filly with plenty of ability. "I hope so anyway! We had a torrid time of stop-start-stop-start niggles with her. It was mainly muscuar and, as with a lot of fillies, once we thought we'd got her sound, she'd often tie up on us and we just had to wait for her system to come right. "Fingers crossed I think she has now because she's done nothing but flourish this summer and although she'll go up from her rating of 82, that's not a disaster because Jon & Julia are very much into the breeding side of things with their fillies and obviously black type is the long term aim. "She's not an imposing filly but she's very athletic and once she gets going in the closing stages she really does find an extra gear. I hope there's plenty more to come."